(CNN) -- Ferrari are the most successful team in Formula One history, with the legendary Italian marque boasting a record 16 constructors' titles and 15 drivers' championships. The "Prancing Horse" enjoy passionate support unrivaled in the elite division of motorsport, but it also brings with it a unique pressure. The Maranello-based marque are without a drivers' title since Kimi Raikkonen drove to glory in 2007, and Ferrari have not claimed the constructors' crown since 2008. After a third-placed finish in the 2011 constructors' standings -- some 275 points adrift of champions Red Bull -- the pressure will be on team principal Stefano Domenicali to deliver success in 2012. The early signs were not encouraging, with chief engineer Pat Fry warning that Ferrari were well off the pace ahead of the opening race. The Spaniard saw his title as F1's youngest double world champion taken by Red Bull's Sebastian Vettel last year after only registering one race win all season. Alonso's victory at Silverstone, on the 60th anniversary of Ferrari's first grand prix win at the same British circuit, was a rare highlight in an otherwise disappointing campaign for the 30-year-old. The former Renault and McLaren driver finished fourth in the drivers' standings, 135 points behind Vettel, and he has called for a vast improvement from the team in 2011. If Alonso is to satisfy the hoards of Ferrari supporters, he will need to deliver the drivers' championship the "tifosi" have been waiting five years for. After six seasons with Ferrari, the Brazilian's position within the team looks precarious as he enters the final year of his contract. 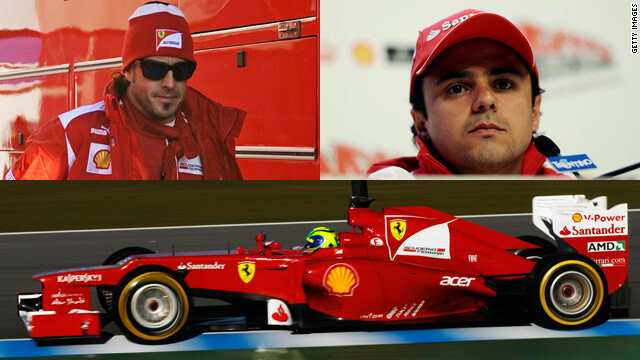 Massa failed to achieve a single podium finish in 2011, with just six fifth-placed finishes from 19 grands prix. He was unfortunate to be hindered by three retirements, especially as two of those were due to mechanical malfunctions. A well-publicized spat with McLaren's Lewis Hamilton was another low point in Massa's season and much more will be needed if the 30-year-old is to extend his stay at Maranello. He was runner-up to Hamilton by just one point in the 2008 world championship, but his form has not been the same since suffering horrific head injuries in Hungary the following year.